Anita D. LaCaze, born Marie Anita DeLouche July 31, 1923, went to be with the Lord Monday, April 23, 2018, just prior to her 95th birthday. Anita was part of the Greatest Generation born before the Great Depression and lived long enough to witness and experience the digital age. She started working at an early age for the Ration Board during World War II. She later attended Spencer Business College in Shreveport. She married Samuel (Sam) LaCaze Jr. in Cloutierville where they lived for many years. They later moved to Natchitoches where Mrs. LaCaze worked in the real estate business for many years before working for 20 years as Deputy Registrar for Natchitoches Parish Office of Voter Registration. Mrs. LaCaze was preceded in her death by husband, Sam; mother, Marie Anita Vercher Delouche (whose name she shared); father, Numa DeLouche Sr.; sister, Numalee Pauline DeLouche; brother, Numa Jean Louie DeLouche (who both died in early childhood); and sister, Fanny Teresa Dorsey. 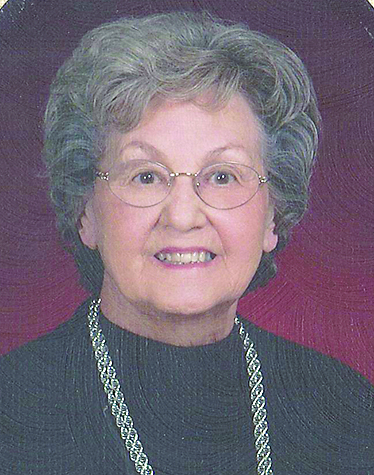 She is survived by her three grown children, Linda Carol LaCaze Kaufman and husband James V. Kaufman Jr. of Biloxi, Miss., Randall (Randy) Steven LaCaze and wife Deborah Ann Foshee LaCaze of Natchitoches, and Tina Jeanine LaCaze of Santa Fe, N.M. Mrs. LaCaze has five grown grandchildren, Lisa Toye Kaufman of Biloxi, James V. (Trey) Kaufman Jr. and wife Sonya Ellis Kaufman of The Woodlands, Texas, Randall Steven LaCaze Jr. and wife Haley Ann Atherton LaCaze of Natchitoches, Holly Rachelle LaCaze Cain and husband Joseph (Jed) Cain of Natchitoches, and Leanne Marie LaCaze Bridges and husband James (Jamie) Oliver Bridges of Pineville. She lived to enjoy six great-grandchildren ages three-14, Corynn Lea LaCaze, Emerson Elle Cain, Jake Horner Cain, Moss Broussard Cain, Kaitlyn Renee Kaufman, Breanne Marie Bridges and Bailey Grace Bridges; nieces, Jacqueline Dorsey Widman and husband Jay Widman of Kingwood and Tenita Janelle Dorsey (now deceased). Visitation will be at Blanchard St. Denis Funeral Home from 9-10:45 a.m. Saturday, April 28 with the funeral service to follow at Immaculate Conception Catholic Church at 11 a.m. Burial will be at Memory Lawn Cemetery.